LeConte's Sparrows are a small sparrow, usually 4 1/2 to 5 1/2 inches in length. The sexes are very similar in appearance. The face, throat, breast and superciliary are distinctly buffy or ochre in color. The belly is white. Malar stripes are weak or absent and streaking on the breast is also absent, although there is some streaking of the flanks. The auricular patch is a pale gray color. The nape is lavender to pinkish and has fine chestnut streakings (Lowther 1996). The dark crown is bisected by a white stripe (Walkinshaw 1968). The tail is as long as the wing and the tail feathers are very narrow and pointed. The wings are round and short with an edge of white present (Lowther 1996). Juvenile LeConte's Sparrows are relatively similar to adults with buff on the face, throat and breast. However, this buff is usually duller. The crown stripe is buffy colored. The nape is unstreaked and also buffy. The breast has fine streaking (Lowther 1996). LeConte's Sparrows coexist with Nelson's Sharp-tailed Sparrows (A. nelsoni), Baird's Sparrows (A. bairdii), and Grasshopper Sparrows (A. savannarum) and identification can be challenging. Nelson's Sharp-tailed Sparrows have a gray unstreaked nape, a prominent auricular patch and no crown stripe. Baird's Sparrows have a buff crown stripe extending to the nape, a distinctively dark malar stripe and streaks across the breast. Grasshopper Sparrows have yellow lores and are buffier and duller on the face extending to the underparts and belly. The song of the LeConte's Sparrow is also diagnostic. This extremely short burst of song usually lasts less than 1 second and is characterized as a very insect-like "tzeek-tzzzz tick" (Oberholser 1974). 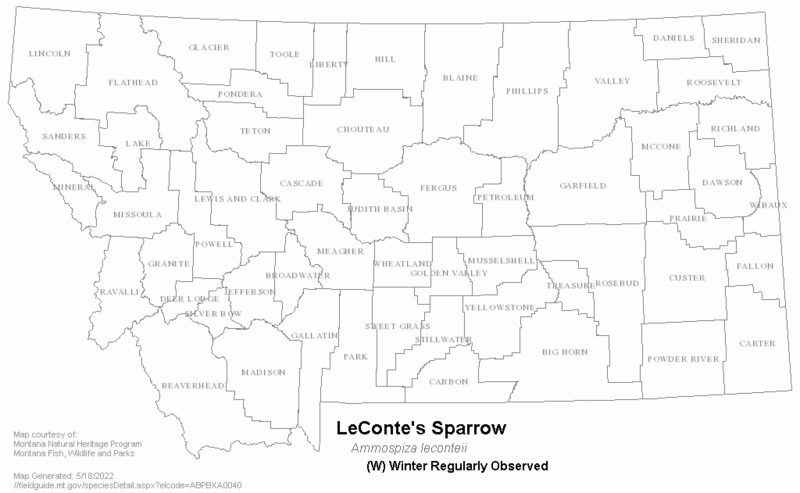 Little is known about migration patterns of LeConte's Sparrows in Montana. Very few records exist for LeConte's Sparrows during migration, with the majority coming during fall. They have been observed during migration in only 5 quarter-latilongs (Montana Bird Distribution Committee 2012). Interestingly, these few observations have come from areas of higher human population: Great Falls in May, Glacier National Park in June, Billings in September, Helena in October and Missoula in December. LeConte's Sparrows are short-distance migrants, remaining within North America during their migratory cycle. They apparently migrate at night singly or widely spaced (Lowther 1996). Fall migration begins in September and birds usually arrive at wintering locations in November (Murray 1969). The majority of species migrates through the Great Plains east to the Mississippi Valley. Records from California and the east coast are uncommon and considered vagrant young birds. LeConte's Sparrows migrate north to the breeding areas usually in March to April (Terres 1980). 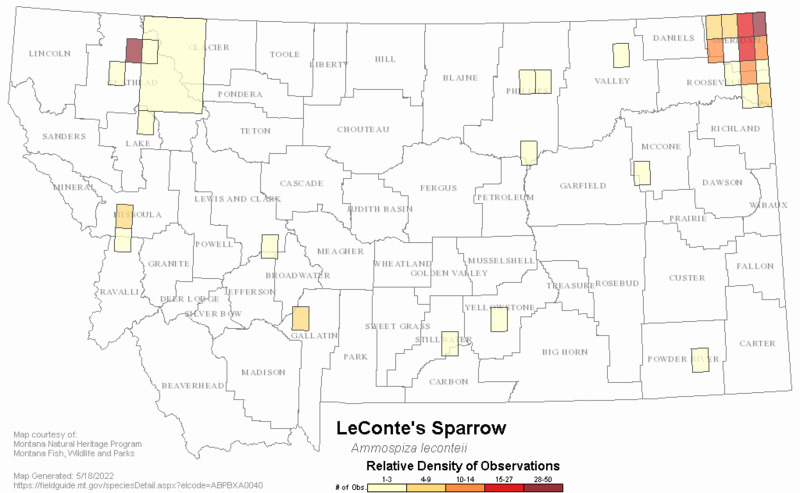 Montana is at the periphery of the LeConte's Sparrow's range. A small disjunct area of their breeding range does occur in the northwest corner of the state (Davis 1952). Breeding records from extreme northeastern Montana show this species is present and possibly expanding its known range westward from the eastern half of North Dakota. Habitat appears to be quite limited in Montana, indicated by the very few documented breeding occurrences. 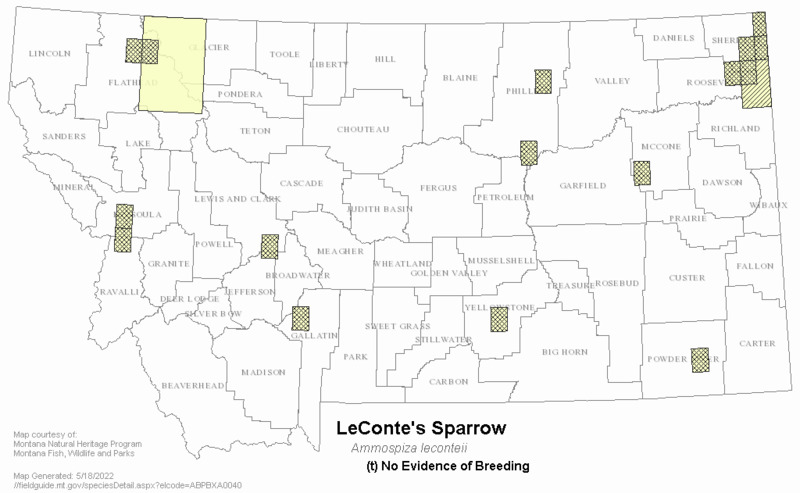 The areas in northwest Montana where LeConte's Sparrows have bred are wet meadows within peatlands, often with a strong sedge (Carex) component. Several species of Carex have been documented in LeConte's Sparrow habitat, including Carex aquatilis (water sedge), C. interior (inland sedge), C. sartwellii (Sartwell's sedge), and C. nebrascensis (Nebraska sedge). This habitat type is similar to the wet meadow bog and sedge meadow habitats LeConte's Sparrows have been known to use in Alberta (Semenchuk 1992). 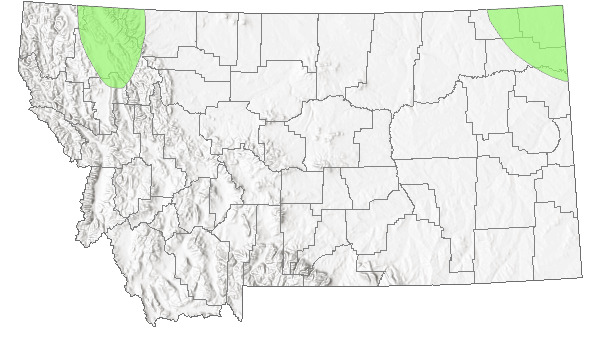 Davis (1952) argues this northwestern Montana population has possibility spread south from northern Alberta. LeConte's Sparrows have also been found in a few other habitat types. Subirrigated meadowland with short stands of grasses is one habitat where the species has been documented breeding. The elusiveness of LeConte's Sparrows in the breeding habitat may account for the limited knowledge regarding them. Food habits studies have not occurred in the state. Information from studies in other areas of the species' range indicate that LeConte's Sparrows eat mainly seeds in winter, and insects and spiders in summer. This species is a ground forager (Terres 1980). No ecological information is available in Montana. Information from other areas of the species' range state the rough estimates of breeding territory sizes in North Dakota and Minnesota were 0.0009 to 0.004 hectares (Murray 1969, Cooper 1984). 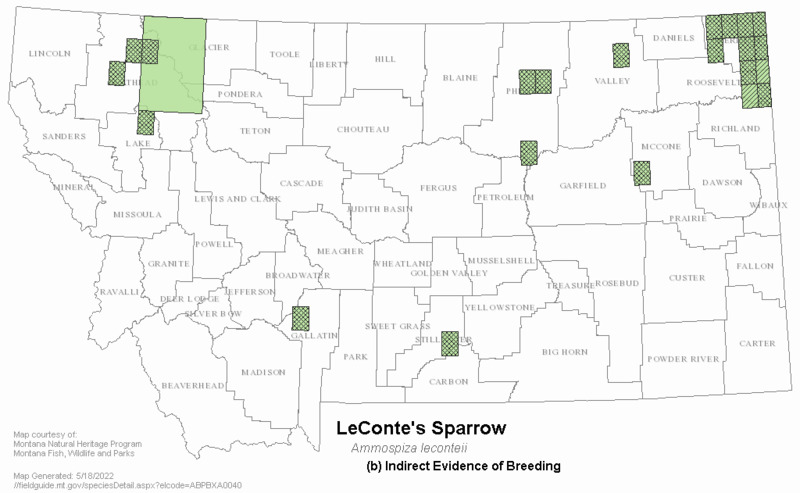 Little information is available regarding LeConte's Sparrow reproduction in Montana. Potential breeding locations are often inaccessible and difficult to survey. LeConte's Sparrow nests have been located in Montana during July (Davis 1952), including a nest with eggs seen in Glacier National Park on July 15, 1951 (Davis 1961). Egg dates are probably similar to those in Saskatchewan and Manitoba: June 4 to 21, and Alberta: as early as June 6 (Johnsgard 1992). Information from other portions of their range found that eggs are laid from late May to early July with a clutch size of 3 to 5 (usually 4). Incubation, by the female, lasts 11 to 13 days. The female exclusively tends the young at first; the male helps after a short period of time. 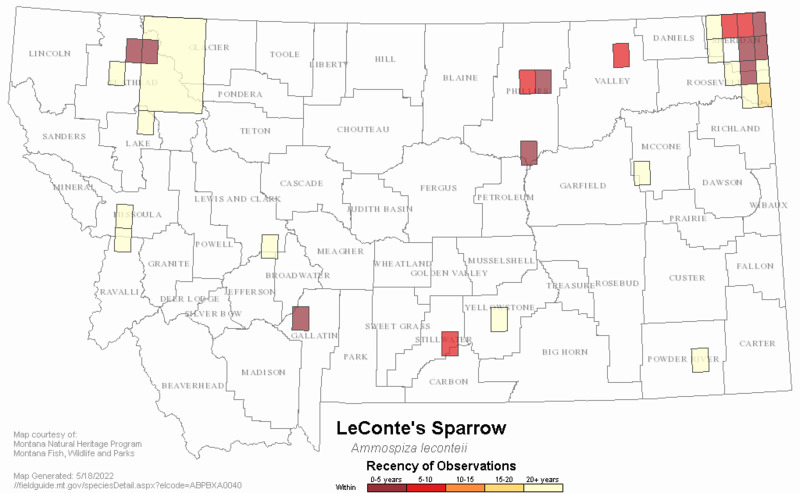 No known active management is ongoing for LeConte's Sparrows in the state. Conservation Reserve Program practices may provide large blocks of suitable habitat for this species in northeastern Montana. Cooper, S. 1984. Habitat and size of the Le Conte's Sparrow territory. Loon 56:162-165. Murray, B.G., Jr. 1969. A comparative study of Le Conte's and sharp-tailed sparrows. Auk 86:199-231. Semenchuk, G. P. 1992. The atlas of breeding birds of Alberta. Federation of Alberta Naturalists, Edmonton. Walkinshaw, L.H. 1968. Le Conte's sparrow (Passerherbulus caudacutus). In: O.L. Austin, Jr., ed. Life histories of North American cardinals, grosbeaks, buntings, towhees, finches, sparrows, and allies, part 2. Pp. 765-776. United States National Museum Bulletin 237. Reprinted by Dover Publications, Inc., New York, NY. Dale, B. 1993. 1992 Saskatchewan non-game bird evaluation of North American waterfowl management plan: DNC and short grass cover - 1992. Unpublished report. Saskatchewan Canadian Wildlife Service, Edmonton, Alberta; Saskatchewan Wetland Conservation Corporation, Regina, Saskatchewan. 23 pp. Dale, B.C., P.A. Martin, and P.S. Taylor. 1997. Effects of hay management on grassland songbirds in Saskatchewan. Wildlife Society Bulletin 25:616-626. Davis, D.E. 1952. Leconte Sparrow in Western Montana. The Condor, 54:115-116. Dhol, S., J. Horton, and R.E. Jones. 1994. 1994 non-waterfowl evaluation on Manitoba's North American Waterfowl Management Program. Unpublished report. Wildlife Branch, Manitoba Department of Natural Resources, Winnipeg, Manitoba. 12 pp. Friedmann, H. 1963. Host relations of the parasitic cowbirds. United States National Museum Bulletin No. 233. Friedmann, H., and L. F. Kiff. 1985. The parasitic cowbirds and their hosts. Proceedings of the Western Foundation of Vertebrate Zoology 2:225-304. Hartley, M.J. 1994. Passerine abundance and productivity indices in grasslands managed for waterfowl nesting cover. Transactions of the North American Wildlife and Natural Resources Conference 59:322-327. Hoffman, Robert S. and Ralph L. Hand. 1962. Additional Notes on Montana Birds. The Murrelet 43(2): 29-35. Hotchkiss, N. 1948. Bird records from northeastern Montana. Condor 50:274-275. Igl, L.D. 1996. 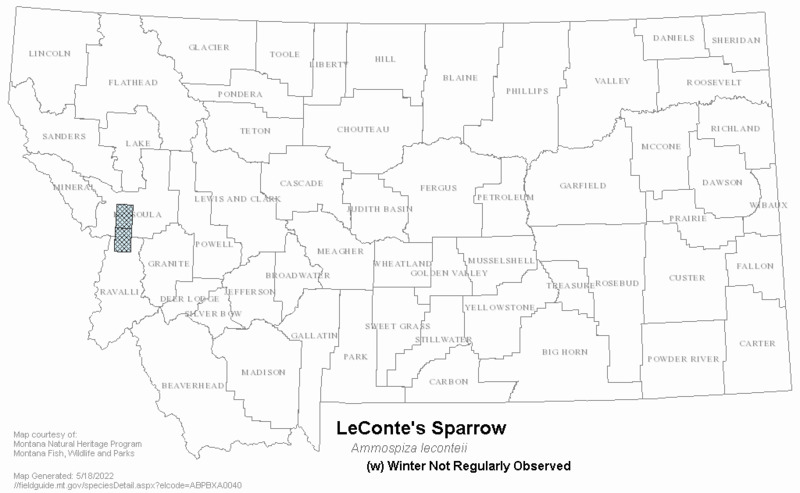 Le Conte's, Sharp-tailed, and Henslow's sparrows in Grant County. Loon 68:127-128. Igl, L.D., and D.H. Johnson. 1995. Dramatic increase of Le Conte's Sparrow in Conservation Reserve Program fields in the northern Great Plains. Prairie Naturalist 27:89-94. Igl, L.D., and D.H. Johnson. 1999. 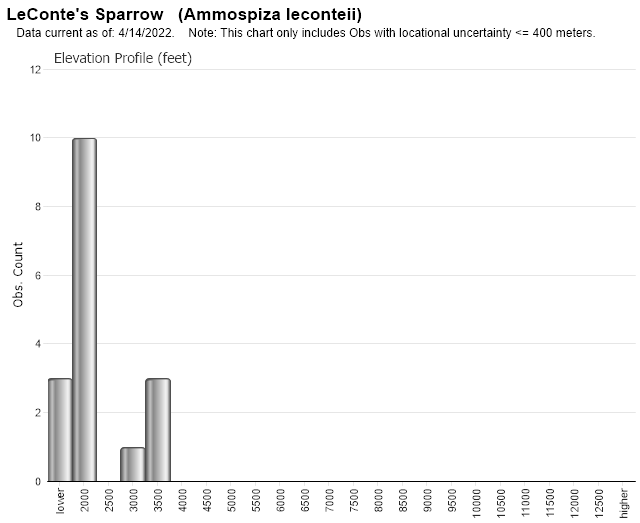 Le Conte's Sparrows breeding in Conservation Reserve Program fields: precipitation and patterns of population change. Studies in Avian Biology 19:178-186. Jones, R.E. 1994. Non-waterfowl evaluation of Manitoba's North American Waterfowl Management Program. Unpublished report. Wildlife Branch, Manitoba Department of Natural Resources, Winnipeg, Manitoba. 15 pp. Madden, E.M. 1996. Passerine communities and bird-habitat relationships on prescribe-burned, mixed-grass prairie in North Dakota. M.S. thesis, Montana State Univ., Bozeman. 153 pp. Montana Natural Heritage Program. 2003. Data derived from Element Occurences with no other known source material. BIOTICS. Helena, MT. Niemi, G. J. 1985. Patterns of morphological evolution in bird genera of New World and Old World peatlands. Ecology 66:1215-1228. Peabody, P.B. 1901. Nesting habits of Leconte's Sparrow. Auk 18:129-134. Prescott, D.R.C., and A.J. Murphy. 1995. Bird populations and vegetation structure of tame dense nesting cover (DNC) in Alberta's aspen parkland. Alberta NAWMP Centre. NAWMP-014. Edmonton, Alberta. 19 pp. Prescott, D.R.C., and A.J. Murphy. 1996. Habitat associations of grassland birds on native and tame pastures of the Aspen Parkland of Alberta. Alberta Centre. NAWMP-021. Edmonton, Alberta. 36 pp. Renken, R.B. and J.J. Dinsmore. 1987. Nongame bird communities on managed grasslands in North Dakota. Can. Field-Nat. 101: 551-557. Richter, C.H. 1969. The Le Conte's Sparrow in northeastern Wisconsin. Passenger Pigeon 31:275-277. Robbins, S. 1969. New light on the Le Conte's Sparrow. Passenger Pigeon 31:267-274. Saunders, A. A. 1921. A distributional list of the birds of Montana: With notes on the migration and nesting of the better known species. Pacific Coast Avifauna No. 14. Tester, J.R., and W.M. Marshall. 1961. A study of certain plant and animal interrelations on a native prairie in northwestern Minnesota. Minnesota Museum of Natural History, Occasional Papers 8:1-51. Walkinshaw, L.H. 1937. 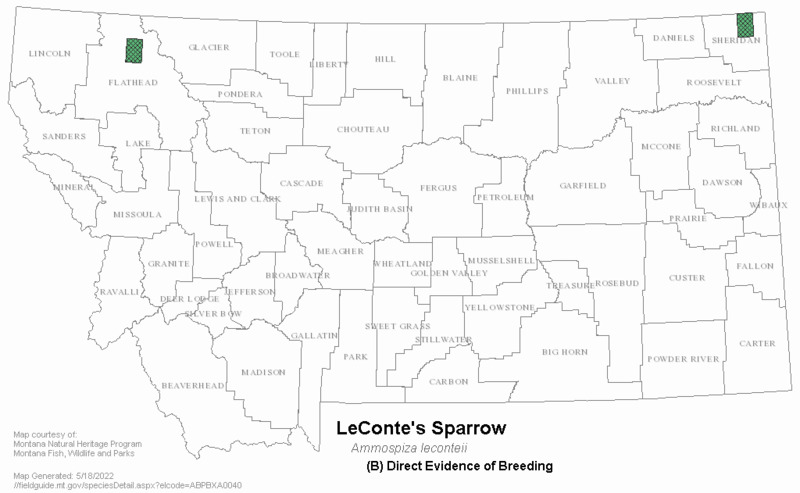 LeConte's Sparrow breeding in Michigan and South Dakota. Auk 54:309-320. Web Search Engines for Articles on "LeConte's Sparrow"